- Boosting your skin’s inner resilience for bouncy, poreless looking skin. In collaboration with one of the world’s foremost authorities in skin cell function research, SK-II’s joint study unveils that turning on our skin’s "Master Switch" enables the protection of epidermal stem cells, by optimising its environment. The result? Poreless-looking, bouncy skin. - Activating your skin’s "Master Switch". As women approach the big 'Three-O', the unforgiving signs of skin ageing surface more evidently, causing our skin to lose its firmness, our pores to enlarge and fine lines to appear. To address this issue, SK-II’s extensive study of our skin cells unveiled that the key to our skin’s youthful beauty lies its "Master Switch". Led by this discovery, SK-II crafted a new pathway to transform the way our skin's youth activity functions with groundbreaking STEMPOWER Technology. Formulated with the new Stem-Acanax ES Complex, the innovative STEWPOWER Essence helps women to achieve poreless-looking bouncy skin after 2 weeks. The new Stempower Essence includes new key ingredients such as Kinren Extract and Artichoke Extract. - SKII Pitera: SKII signature ingredient that works to improve the 5-dimensions of crystal clear skin. When combined with Artichoke Extract, it helps to increase our skin cell's anti-oxidation function to protect the environment of epidermal root cell. - Stem-Acanax: promote the formation of lift-proteins that is critical in improving skin's radical firmness. Use about 1-2 droppers of SKII Stempower Essence each time and apply it smoothly onto the entire face and add a few more drops on concerned areas with a gentle knuckling motion. Recommended to be used together with SKII Stempower. At the launch event itself, a fellow blogger told me, "If you like SKII Cellumination Essence, you will love SKII Stempower Essence." Me being me, I'm always skeptical so I was like, "really meh?" deep inside my heart. I mean, after years of writing about beauty, I have tried countless products and I'm sure most of you know what suit others might not suit you. You know with age comes financial stability but sometimes age comes alone. Personally, if I don't sleep well the day before or if I skip moisturizer for a night, you can easily spot fine lines, huge pores and even dry skin on me. Horror, horror, horror. 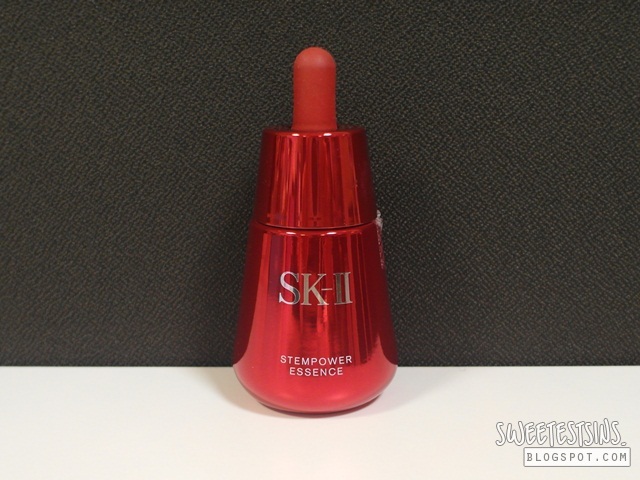 I have been using SKII Stempower Essence twice a day, both day and night. In the day, I apply SKII Cellumination Day Surge after SKII Stempower Essence while at night, I apply SKII Stempower after applying SKII Stempower Essence. 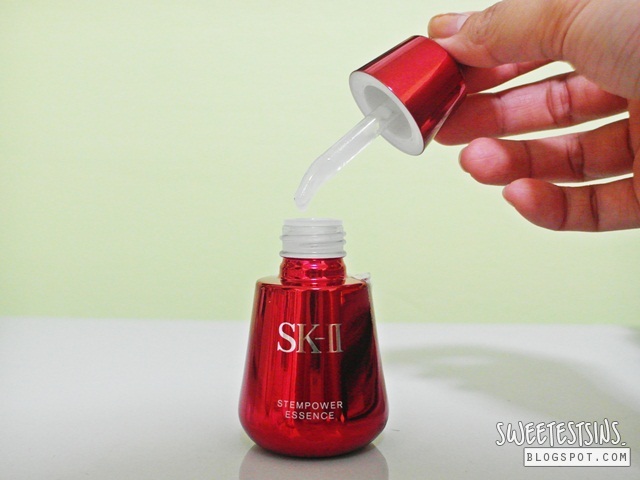 I find that SKII Stempower Essence absorbs into my skin rather quickly, even more so when I use SKII Facial Treatment Essence before applying SKII Stempower Essence. After incorporating SKII Stempower Essence into my skincare regimen, I realised that my pores became less visible and thus less noticeable. I also noticed that my skin feels smoother and look plumper. Just the other day, I had a whitening mask on. On the following day, the skin around the sides of my forehead started flaking and itch. I applied more SKII Stempower Essence directly at that area and about two days later, the flaking stopped. On top of that, I realised that when I apply SKII Stempower Essence directly over my breakouts and massage my face, it helps in reducing the swelling and redness!